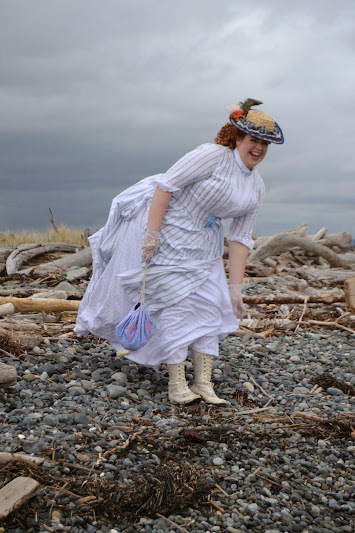 Friday, I woke up bright and early, donned my Miss Pettigrew outfit, and headed to my hard-bottomed reticule class. It was a great class, and I finished my reticule! I also attended nuranar's class about self-trimming, which was so useful and informative, and jennylafleur's class on curling hair (apparently, I'm doing everything wrong, but my hair certainly does seem to hold a curl!). 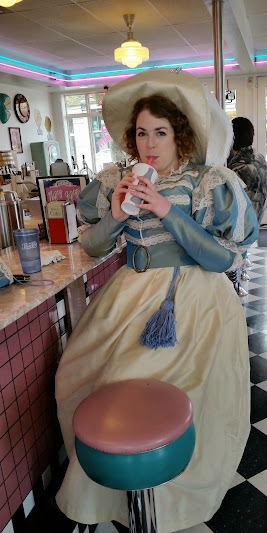 Thanks to starlightmasque for taking the only pictures of me in this outfit! 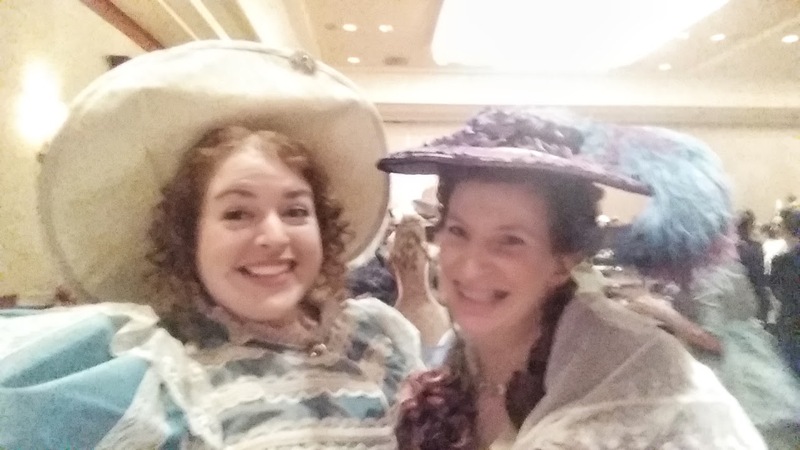 Selfies with big hats are hard, right, vanessa_lynne? Then of course, it was the Pink Princess party, but I only made it to 10:30 before turning in for the night. 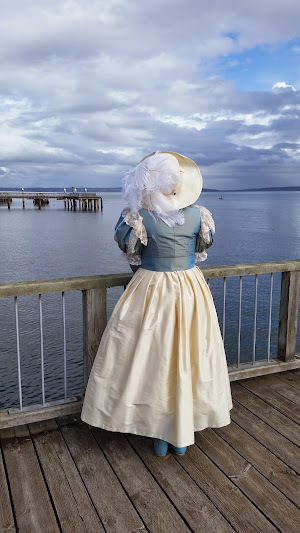 I had sooo much fun at the Victorian Festival in Port Townsend this weekend! Like last year, it once again fell on my and my boyfriend's birthdays (his is the day before mine). We had some crazy weather while we were there. On Friday, it was 27mph wind, so we didn't do much wandering around. 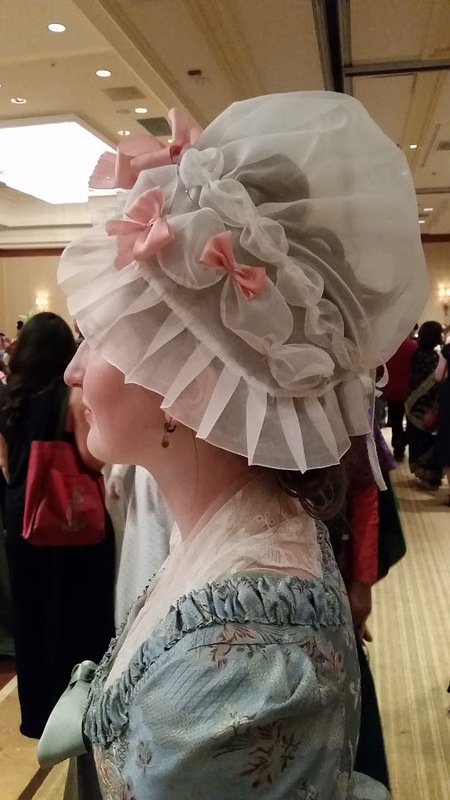 In fact, as I was trying to leave the hotel in my Ravenclaw bustle, I had to go back in first to take off my hat, and second to take off the pleated tail on the bustle. So no pictures from Friday. Sunday, my birthday, was marvelous. We packed up and checked out of the hotel, and then I headed over to tea with Val, Gina, and her mom. Tea was delicious, and then we headed over the to fort, and met up with my BF to hang out and take lots of pictures. It was amazing! 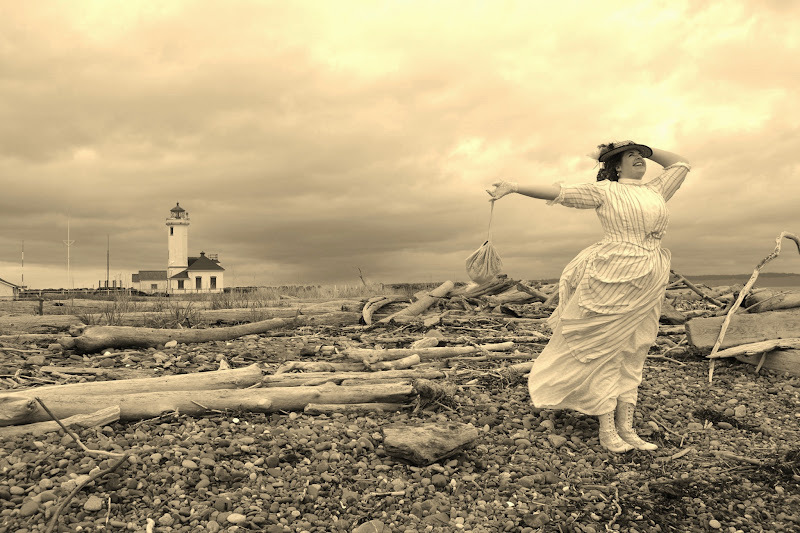 It had turned quite windy again, and was very cold, so I unfortunately had my capelet on for most of the pictures, but they still all turned out amazingly! Thanks Gina! The SITU event today was lovely! We had a wonderful potluck lunch at a clubhouse in West Seattle, with a live band, and even a caller for a few country dances. Unfortunately, not many people actually danced, but I hope that doesn't discourage them from doing a similar event in the future. I wore my archery dress, and I have to say, I am sooo happy with it! I finished my hat last night, which I am mostly content with, and this morning, I even did my hair so easily that I had time to make a quick and easy reticule. I can't wait to wear this again! And now the picture proof! I finished hemming the skirt, and I sewed all the hooks on the bodice. I want to try it on one more time before I sew the eyes on. I'm also waiting till I have the bodice on in order to mark the eyelets for the belt, so that will get finished tomorrow, too. My feathers arrived in the mail today, which is good timing. I should have gotten bigger ones. 16-18" seemed big, but the 17" feathers just don't compare to the giant ones they were using at the time. Oh well - I'll make do. I also started cutting out the pieces for the hat. I got all the silk pieces cut out, and I cut out everything I could out of buckram until I ran out. I'll have to pop into Joanns tomorrow morning before I can sew anything together - I thought I had more buckram! I should have plenty of wire, though, I hope! I think I still have some left over from when vanessa_lynne and I had our hat-making day (because I haven't touched that hat since!). This hat will have an 18" wide brim, with a 7" tall crown. I hope I got my dimensions right - I couldn't find a back view of a hat from 1831, but all the ones from the four or so years prior had really tall crowns. I won't have all the other accessories I want by Sunday, but most of them are archery-related anyway, so that's okay. 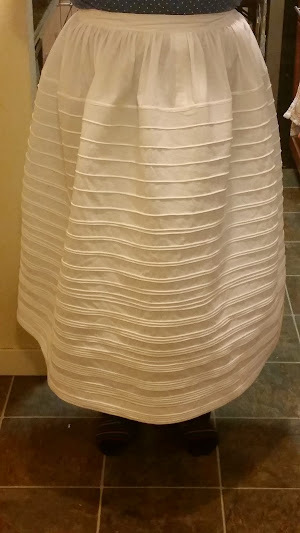 I made a quick and easy petticoat! Last summer, I found a great lace-edged bedskirt at a garage sale, and picked it up knowing it would make a great petticoat. Now it has. It's just two 46" panels stitched up the side and gathered onto a waistband. Nice quick project. My boots are also shown above, but I think there's significantly more sand color on one boot, so I'm probably going to dab a little more on the other boot tomorrow. I also sewed all the buttons onto the braiding on the bodice. And I pinned up the hem on my skirt, and started stitching that. I'm hoping to finish all the other hand-sewing stuff tomorrow night, including the bodice closures. That way on Saturday, I might have time to make a hat. My feathers say that they're in WA, so I'm hoping they might even come tomorrow! I figured out my ruff! I cut a strip of organdy, tea-dyed it, and tapered the ends. Then I hemmed one edge, gathered up the other edge, encased it in bias tape, and hand-sewed the tape into the neckline. I also stitched down the piping on the neckline, hemmed the sleeves, and started to sew the buttons on the braiding. And I painted a watered-down coat of "sand" over my boots. I think they're a lot closer to the bodice fabric color now, which makes me a lot happier. Unfortunately, Joanns was out of the size 3 hooks and eyes when I went today. So unless they call me that they've gotten them in by tomorrow after work, I'm almost definitely going to have to go with size 2. I hope they hold! I sewed my sleeves into the armseyes, adding the piping and lace and the shoulders. I also made additional piping, and sewed it on around the neck and down the front of the bodice. I'm hand-stitching that down on the inside at the moment, though for some reason, I'm hesitant to stitch the neck down before I decide what I'm going to do for the ruff at the neck. 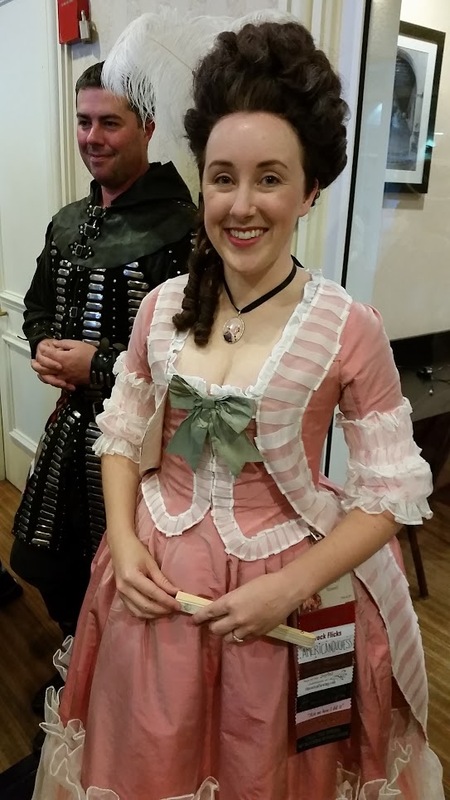 Tomorrow, I'm hoping to hem the sleeves and bodice, and figure out what I'm doing with the ruff. I'm also going to sew the decorative buttons on the braiding, which I almost forgot about. If I have time, I'll work on the belt, too, which basically just needs to get put on the buckle and have the end finished. Then, it's actually making the ruff, and adding the hooks and eyes up the front. I'm hoping to have time to make a petticoat before hemming the skirt, because right now, all I have under there is the corded petti. I highly doubt I'll have time to make the hat before Sunday, and my feathers won't have arrived anyway, though that does mean I'll have to figure out what to do with my hair. I feel like I worked forever today on the archery dress, and I don't feel like I'm too much farther along. I made piping, or at least some piping. (I think I'm going to have to make more, but I only had about 90" of cording.) I did wind up taking apart the sleeves to insert the piping and lace above the elbow, because I think it would have looked messy if I just sewed it on top. I also decided on which lace to use for the shoulders, and cut and gathered that. I tried on the bodice again when working on trim placement, realized that a) I needed to take up part of the shoulder seam, and b) I think I'm going to have to pad my bust, which is really weird to me. 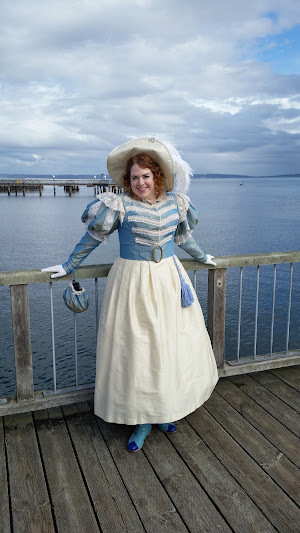 I'm getting a weird line in my center bust because of the busk of my corset - not sure how they managed to mask this in the early 1830s, when they wore corsets with big wooden busks in them. I know the Victorians padded - maybe they padded in the 30s, too? I did get my trim placement figured out, stitched together the trim layers, and stitched all that on, too. The whole day, I was just waiting for the moment when I would run out of my ivory and my dusty blue thread, both of which I had almost none of at the top of the day. Somehow, though, through a very vigilant use of various bobbin threads, I managed to make it the whole day with just enough thread (that said, I will definitely have to stop at Joanns after work tomorrow). I'm going to pipe the CF opening, as well as the shoulder seams. And I think I'll be using hooks and eyes to close it, because I have no idea what else would make sense. I also have to figure out what I'm going to use for the ruff around the neck. I don't know that I have enough organdy left, and then I would have to tea-dye it to make it ivory. But otherwise, I would have to use lace, because using the silk left from the skirt doesn't seem like it makes sense. Plus, I have no idea which lace I would use - there are so many already in this bodice. If you can believe it from looking at the pictures, the lace on the bodice front and at the elbow is actually the same - it started out as 5-6" wide lace with scallops on both edges, and it is left over from my chiffon and lace Edwardian gown from a few years ago (as is the lace at the shoulders). On the bodice, I stitched down the middle so that the scallops would just peek around the braiding I layered on top. The lace on the sleeve puffs is a vintage lace I picked up at some estate sale. I also painted my boots today. The color looked totally right as I was mixing it, but now I'm worried that the blue is really way too turquoise. Maybe I'll wind up brushing some sand color over the light blue before sealing them. My archery dress sleeves are huge-mongous! I even chopped two inches off the bottom of the puff, so that I would have enough of my vintage lace to trim them with, and they are still pretty enourmous. Which is exciting, of course. :) They're silk taffeta on the outside. The puffs have a cotton organdy interlining, and I sandwhiched a folded over layer of net in between. The bottom part of the sleeve is interlined with muslin. I drafted the top pattern on my own, and based the bottom part off of a big-three pattern. I realized after I made the sleeve that I should have sandwhiched piping and a lace ruffle in between the two sleeve pieces, but since I don't want to undo/redo them, I will handsew the trimmings on. I'm hoping I don't have to add a gusset - not really sure how they dealt with being able to move your arm far enough for archery. Maybe the puff will allow enough room? Here's a bunch of pictures. I actually practiced my archery today, too. My bf and I set up a target in his backyard, and took turns with my bow. Not too shabby! I forgot my bracers, though, so my arm was really stinging after an hour. 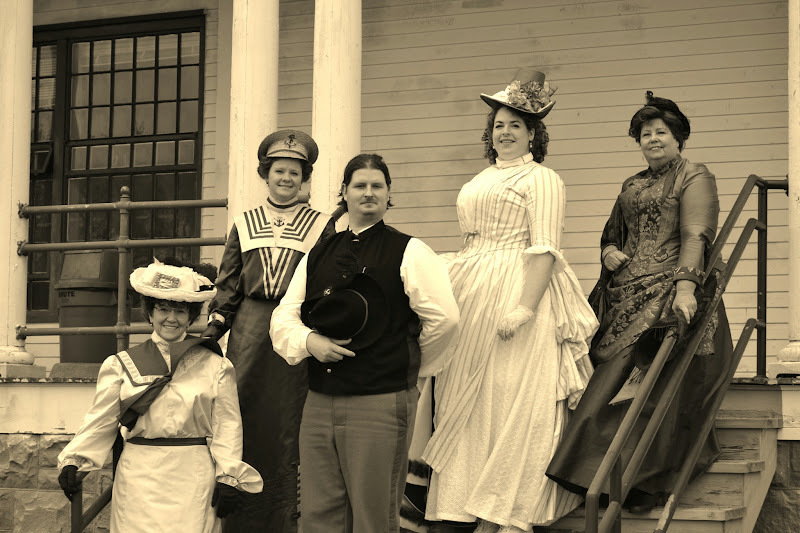 We also visited Fort Langley, BC on Saturday, which was really cool! 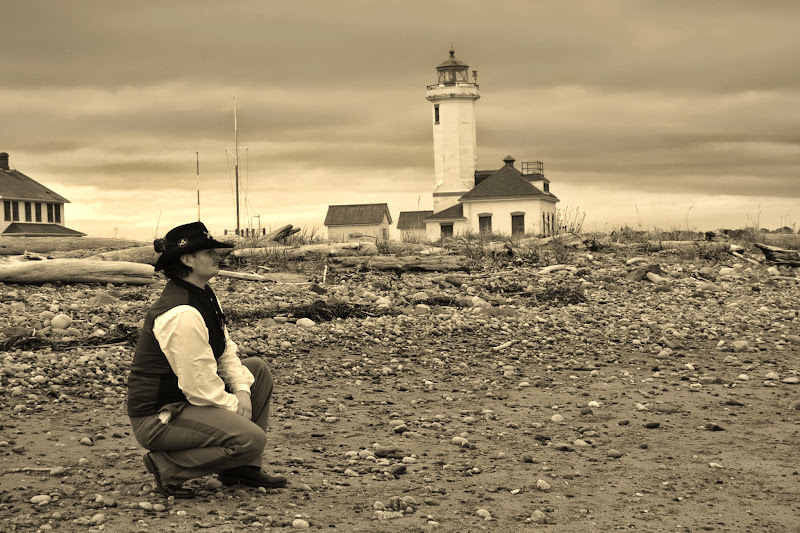 It has some living history elements to the fort, and everything in the whole thing is touchable/interactive. They had some military uniform jackets to try on, too! I'll post more pictures of our awesome weekend soon. In theatre news, we've posted our auditions for 1776, and have a batch of people already scheduled for slots. We also secured a really good venue. I'm so excited! This is really happening!! I got my bow in the mail on Friday! It's so beautiful. This is the original listing, and it looks even prettier in person. Yesterday, I took it to an archery shop, and got a string put on it, and I ordered 5 wooden arrows to be made with fletching kind of similar to my dress. I picked up the arrows today, along with a bow stringer, since wooden bows can't be stored strung. It works really nicely! When I tested the bow yesterday with the aluminum arrows, I hit the bullseye (though granted, the test target is not very far away), and today with all my arrows, I hit within the smallest ring. I think I'm going to bring it all over to my BF's house next week, and we'll set up some sort of target in his backyard. I also found out about an outdoor range nearby, so I think I'm going to see about hosting a costumed archery event this summer. 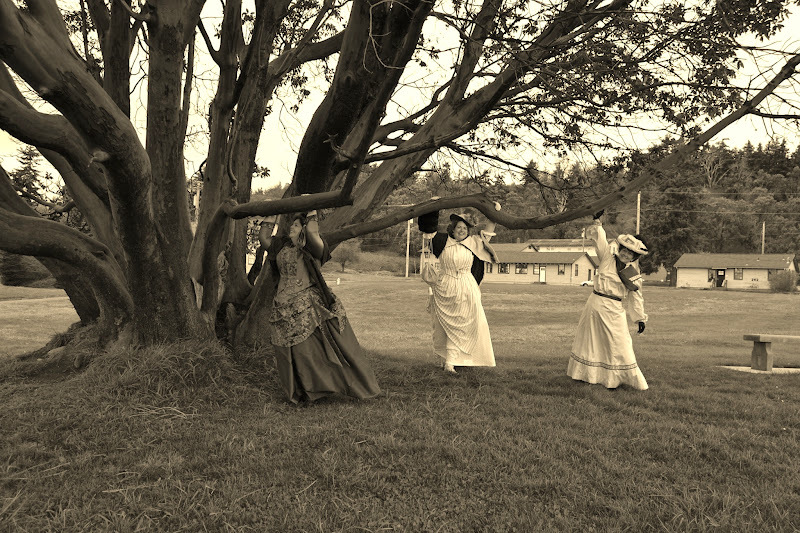 In other costume-related news, I booked our room for the Port Townsend Victorian festival! Is anyone else going? I also went to an estate sale yesterday, and found these lovely pieces! 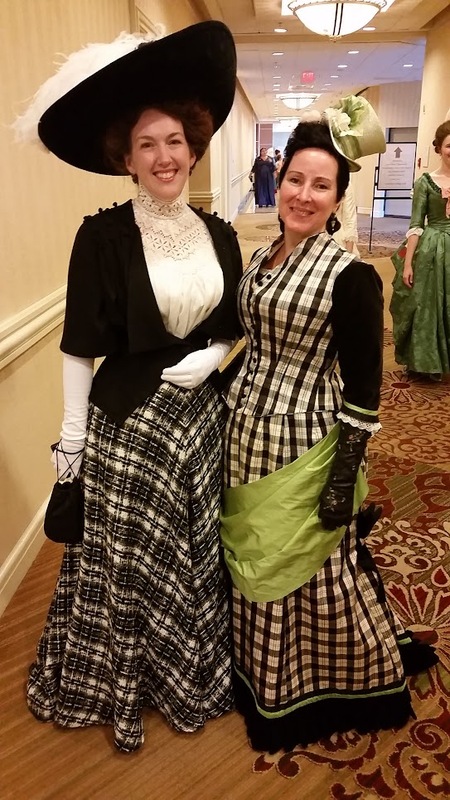 While I've mostly been working away on the two 1830s outfits, I have also done a little bit more work on the 1860s handsewn bodice, whenever I take the bus towards downtown (for some reason, I get naseous if I try to do anything while sitting in any seat except in the bend, and only that bus has a bend). I am now officially done with buttonholes! Next up is sewing on the buttons, which I know will go much faster. Then I actually have to try it on with a corset and mark my side seams. Here's a pic from before I ironed off my buttonhole markings. I have a question for those of you who are knowledgeable about the 1830s - if there is trim making a v-shape in the front of the bodice, and it heads to the back around the shoulders, would it go into another v in the back, or just continue along the top of the back of the bodice? In my case, it would be the ruffle with the corded edge. 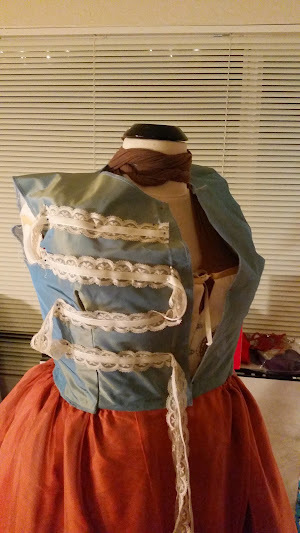 I did a lot of work on the 1830s bodices today. I mocked up my gala bodice using the twill interlining as my fabric, based on the archery bodice, but with an evening neckline. It wound up being oddly big in many places, particularly through the back, and quite long in the waist. And honestly, I have no idea why, because I then flatlined and sewed together the archery bodice, and the only change I had to make was shortening the waist a little in the back, and opening up the armseyes, since they were way too tight. But anyway, after I altered the gala bodice mockup to fit, I ripped it apart, and used it as my pattern for the silk. At this point, I have flatlined the gala bodice pieces, and started on the embellishment in the front. I won't be able to get very far, since I need the stabilizer for the ruffle on the bodice, too, but so far, I've gathered the organza in the center front, and the center front cording is pinned in and ready to be sewn. The archery bodice is assembled, and I'm trying to figure out my trim for it. This is what I'm thinking I'm going to use, though I need to find a ribbon that's a little darker ivory. Please ignore the weird loopings between each row - I don't want to cut the lace until I actually know what I'm doing! Antoinette looks pretty funny with the half-finished gala skirt paired with the beginnings of the archery bodice. I wish my bodices actually fit her! And just as a reminder, I've included the original fashion plate. Looking at it side by side here, I definitely want to make the trim curve more, but I'm also still not positive I like the trim. What do you think? I worked a lot on the skirts today. I finished the waistband on the archery skirt, so now that's just waiting for the hem. I also worked a ton on the orange gala gown skirt. I sewed the organza panels together, hemmed the organza, sewed the cording on the hem and then realized it was totally wrong. So then I spent a couple hours unpicking all my stitches on the cording. I pinned my hem on the taffeta, marked where the cording actually was supposed to go, and sewed on two rows of cording. I also sewed the waists of the two layers together, and gathered them. Below the cording, there will be two 7.75" layers of ruffles, and there's a giant bow at the top of the swoop, which is why it looks so weird now. (I'm also not sure why the cording is flipping apart in the center - I might have to tack that). But I'm having a really hard time trying to figure out what to use to get that rainbow trim. There's a store 30 mins away that has a trim that might work, but it's $6-8/yd, and I need almost 10 yds, and I think that's too far out of the budget. I tried just stitching with rainbow metallic thread, which wanted to pucker the fabric, and I tried painting, which looks fine from far away but looks crappy up close. Any suggestions? I also cut out the bodice pieces for the archery dress, cut out the silk taffeta panels for the orange gala gown skirt and sewed them together, and re-dyed and then cut out the silk organza for the gala gown skirt. The organza was just too peachy from the first time I dyed it, so this time I did a really concentrated bright orange dye bath, and it came out lovely. I've included a pic below (please ignore the mess). Thank goodness all this silk was nice about ripping on the grain. I'm tired of trying to cut things evenly. Luckily both the organza and the taffeta are the same width (44"), so I did three panels of each. I also saw The Imitation Game, which I highly recommend. Benedict Cumberbatch's performance was wonderful, and it was a fascinating movie. 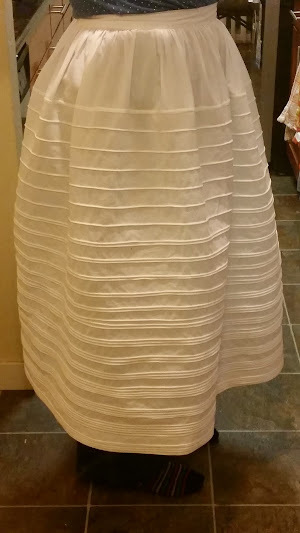 Apparently I went crazy, so I decided to finish the corded petticoat today. 49 rows of cording in all. I had to add a 7.5" wide top piece for length, since the cording shortened it so much! And naturally, I got to what I thought were my last two rows, and ran out of cording, so I had to make a mad dash to Joanns. (Though I then wound up doing four more rows of cording.) I like how it looks, though! I haven't starched it yet. That, and adding the hooks and eyes at the waist will wait till a bit closer to when I'm actually wearing it, which probably won't be for quite a while. And that wasn't the only thing I got done today, too! 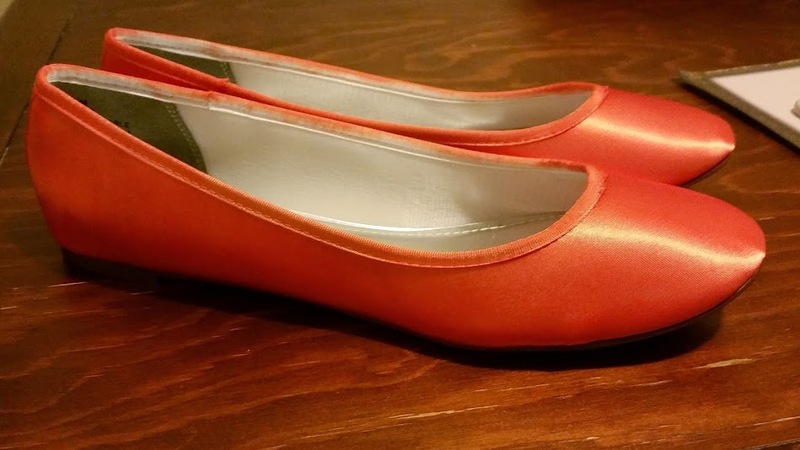 I had a good mail day, and my dyeable flats for the gala gown arrived, as did my new Fugawees. Unfortunately, I had to exchange the Fugawees for a wider size, so those have already begun their journey back to FL. But I did dye the flats! They're very orange. 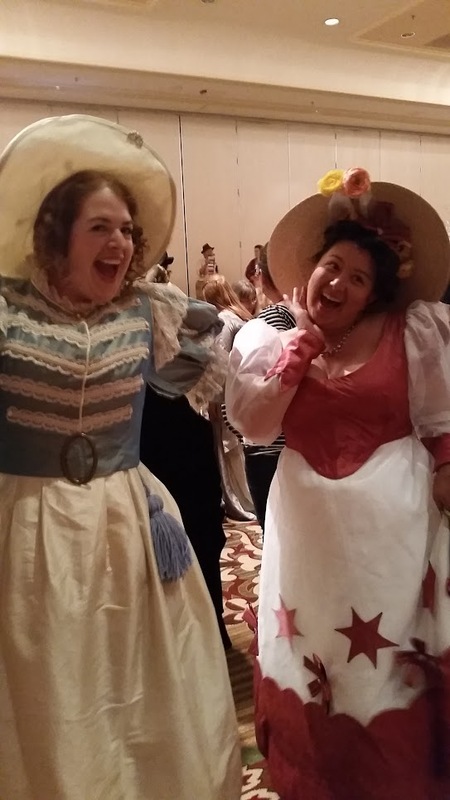 Hopefully not too orange, since the shoes in the original fashion plate were much brighter than the dress as well. I also bought ribbons to match. I also started on the archery dress skirt. The two panels are cut out, the side seams are sewn, and I have pinned all the pleats, so they're ready to be sewn. I think I might have the whole thing finished tomorrow, minus the hem (which will have to wait until I make another petticoat, plus I want my Fugawees back before I hem). Not sure, though, since I'm really hoping my BF and I will finally go see The Imitation Game. Plus, my parents' gift to me of Ticket to Ride arrived today, too, so I think a round of that is in order. I tried to find wool for the archery dress, but there was just nothing in my price range locally or online. However, I found a 5yd remnant of silk yesterday at the fabric store (it's like a home dec dupioni, but heavier weight and not so many slubs), so silk it is. It was on sale, 25% off the remnant price of $9.99, so I figured it was the smarter option, even if it wasn't ideal. I also dyed my silk organza yesterday. It came out slightly paler than I had hoped, but I think it will work just fine. 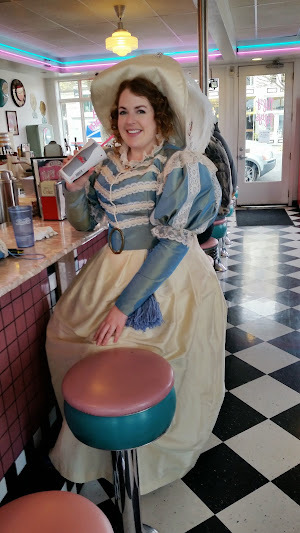 I've been working more on the corded petticoat, too, now that I'm back in Seattle. At this point, I have 14 rows done. It's starting to get more body, so I'm hopeful that I'm actually doing the right thing. Please help me decide what fabric to use for my archery dress. Initially, I was thinking I would use this blue/gold shot silk taffeta for the bodice, and an ivory silk taffeta for the skirt. But all the fabric stores around here struck out on the ivory silk today. One had a sort of light tan silk for 9.99 (just slightly darker than the brocade background, pictured below), but that was the closest. So, which should I do?